President Lincoln is quoted quite often and is the master of “witty” sayings. The Civil War is one war still being fought today (which hasn’t changed the outcome) but everyone wants to add their opinion. Gerald Augusta and his wife Sandy, our speakers on the 9th were not only well informed they were in full authentic costume. He as a full colonel complete with saber and she in a dress, with bonnet and parasol. He said this particular war is known by about 30 different names and Tennessee played a major part because of the natural resources we have such as lead, copper and salt. We have a new member! 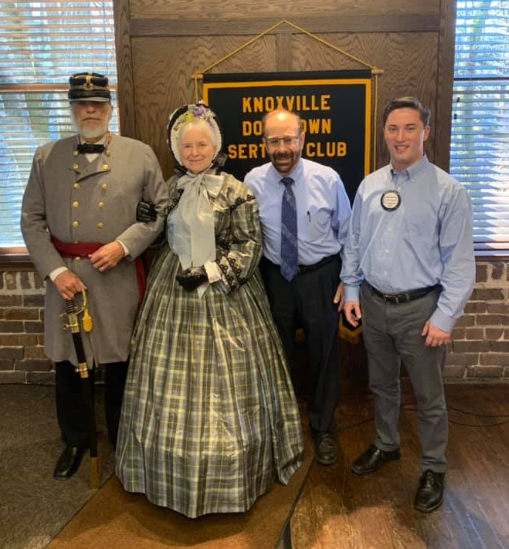 Josh Walker that joined our Knoxville Downtown Sertoma Club. He came about from Rusty and with the Holidays I’m thinking we all just passed him off and have failed to give him our Tennessee welcome. Hunt him down next Wednesday with a hardy Howdy! The board meeting held on 01.08 didn’t produce anything. I missed it due to the annual HOA meeting where I live but best, I can tell they ate dinner and had a good visit. Nothing was voted on. A professor from South College you is going to tell us how to make beer. Andy Schoerner is responsible for the first and Matt Hall the second. Personally, I need to know how to make wine. Anybody know someone that can cover that?